Captain Jonathan R. Townsend will give a base update brief with an emphasis on its true "jointness". Although doctrinally it is simply a Naval Air Station, it is more importantly almost an even split across all branches of service and the role of our joint force in global "security cooperation." Come listen to one of our premier leaders and the missions that are performed by the Reserve Force structure. Captain Townsend is the 12th Commanding Officer of the Naval Air Station Fort Worth Joint Reserve Base, Texas, since the installation was established as the first joint reserve base in October of 1994. The installation's mission is to provide joint training capability and resources to enable Warfighter readiness while sustaining personnel and their families, community compatibility, and inculcating a culture of safety. 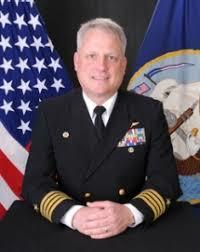 Commissioned with the USNA Class of 1995, he was designated a naval aviator in 1997. He has a Bachelor of Science Degree in Economics and a Master of Arts in National Security and Strategic Studies from the College of Command and Staff at the Naval War College. His sea duty tours include serving Patrol Squadron Ten (VP-10) "Red Lancers", where he deployed to Sigonella, Italy and Roosevelt Roads, Puerto Rico with detachments to Forward Operating Locations Manta, Ecuador; Coma Lapa, El Salvador and Bahrain. He also served two tours with the Patrol Squadron (VP-62) "Broadarrows" with detachments to Italy, Bahrain and Japan. As a staff officer he was the Campaign Planning Chief for the U.S. Southern Command J5 and most recently, the Special Assistant under the Assistant Secretary of the Navy for Manpower and Reserve Affairs. In addition, you will be treated a yearly tradition at this luncheon! Once again, our own Dave Miller of the Great Class of '65, will be giving us a preview of Navy Football 2018. Dave will give us his insight of how well Navy Football will do this year. Come listen to this preview and let's cheer on Navy Football to a year of victory!